On 3 February 1916, one hundred years ago today, a raging inferno consumed the original Center Block and left it a smoldering ruin and a gutted husk of its former glory. Seven perished in the deadly blaze. Only the Library of Parliament and part of the hallway leading up to it survived thanks to the firefighters who doused the fire and the librarians who shut the steel door separating the library from the rest of the original Center Block. The grand old tower put up a magnificent fight for survival. Standing while the support seemed to have burned away, it sent a solid pillow of twisting, billowing gold up into the winter night. Finally, it came down, crashing into the concourse in front and with it, carrying the huge, old clock which had stayed illuminated and kept on striking to the last. This photo album, “The Fire of 1916,” comes from a Facebook group called “Parliament of Canada — Youth Connection.” It chronicles the history of the Old Center Block from the 1880s until it met its fiery demise in 1916; it also shows the efforts to demolish the burned out husk of the Old Center Block and build the current structure in its place. 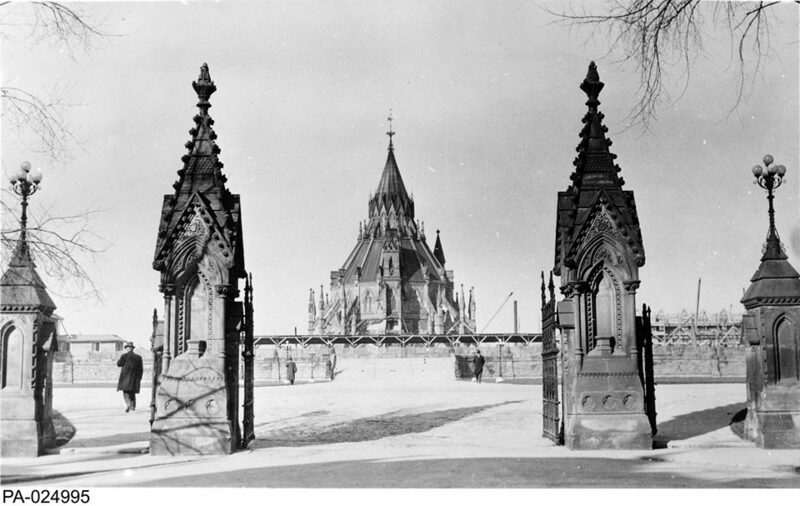 In 1919, the Prince of Wales (who later become Edward VIII and after his abdication, the Duke of Windsor), laid the cornerstone of what would become the Peace Tower. Finally, on Dominion Day — 1 July 1927 — eleven years after the fire, Canadians celebrated the 60th anniversary of Confederation and the Dominion of Canada by opening the Peace Tower. But this Facebook group betrays the ignorance of those who created it and probably of most of those who read it by relying on this caption to describe what I just recounted above: “July 1, 1927: Canada turns 60 and the Peace Tower is inaugurated.” It omits entirely that at the time, we referred to July 1st as Dominion Day (and therefore by implication imparts to the reader that we always referred to July 1st by the banal “Canada Day”) and glosses over that it was not “Canada” per se that turned 60 in 1927, but rather the Dominion of Canada under the British North America Act, 1867, that became a sexagenarian. The second King ministry chose to celebrate the Dominion’s diamond jubilee because its golden jubilee fell during the Great War, only one year after the fire that destroyed the Old Center Block. 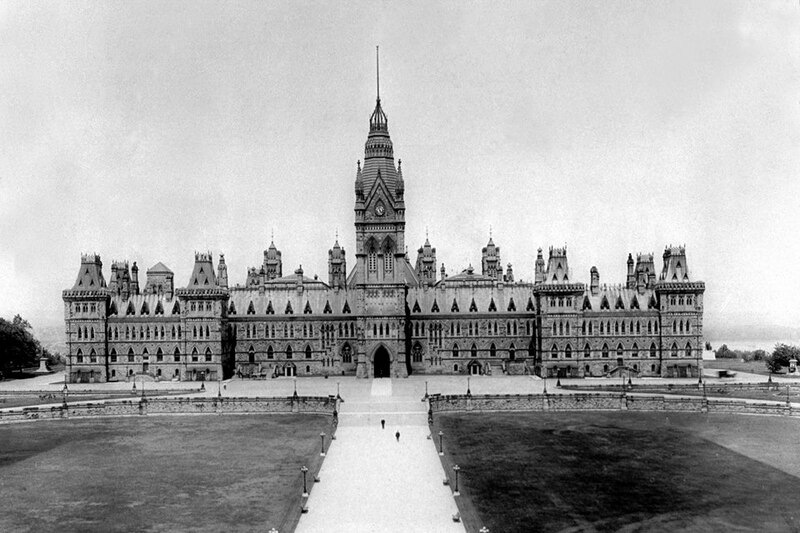 The Library of Parliament stands as the last lonely redoubt of the Old Center Block. So I must ask, to what past are we, particularly my peers, “connected”? I can’t help but conclude that my generation has been robbed of this country’s history and brought up with a profound historical amnesia, after a cultural revolution so insidious in its gradualness yet thorough in its destruction of the past. These 41 photos depict a long forgotten world in which Canadians proudly adorned their official buildings with Union Flags and Red Ensigns and unarmed Peelite police officers dressed in the old British uniform stood vigil at Sir Wilfrid Laurier’s final repose. I felt strangely wistful looking through these photographs of the Old Center Block and the aftermath of its destruction. They tell the story of a country ravaged by war and of the immense sacrifice in blood and treasury that the Dominion of Canada contributed for King & Country and the British Empire. (I think that the British Empire should have remained neutral in that Continental war in 1914, but that’s another issue). But the wistfulness creeps in because what we fought for no longer exists. The British Empire is long gone, and successive governments since Pearson’s have severed and suffocated our organic connection to the past and imposed an artificial monstrosity in its place. Looking at these fleeting glimpses into a blurred past is like gazing into an alternate universe. I feel like Boromir staring at the shards of Isildur’s sword; we’ve inherited nothing more than faded memories and broken heirlooms.